Ah, China. Regrettable financier of U.S. debt. Mass producer of toxic cat food and lead-paint toys. Reviled by human-rights activists for its latest crackdown in Tibet. Criticized by athletes for failing to improve air quality prior to the Olympics. With all the bad press, it's easy to forget that China is also filled with likeable, hard-working citizens who go about their daily lives rather as Americans do — competing for jobs, pursuing degrees. In her fourth book, Students and Teachers of the New China: Thirteen Interviews, Burlington author Madelyn Holmes introduces readers to a range of these folks. The 63-year-old independent scholar met and befriended the book's featured teachers and students while employed as a visiting professor of English at Zheziang University in Hangzhou in 2005-06. Far from encountering a closed society during her year in China, Holmes says she discovered people were "extremely open." Her interviewees come mostly from the country's new middle class: Zheziang is a "key" university — China's equivalent of Princeton or Yale — and Hangzhou is a wealthy, scenic coastal city two hours south of Shanghai. All her subjects were born after the 1949 founding of the People's Republic of China, but many interviewed their parents and grandparents at Holmes' request. The result is a document of 90 years' worth of experiences, demonstrating vast social and economic change. One college student's grandmother remembers being harassed by the Kuomintang Army and losing a child to the 1959 famine. Today, her granddaughter's graduating classmates have started an Internet-based translation company and organized conferences on the environment. Until 1999, jobs in China used to be guaranteed — simply assigned upon graduation. By contrast, the country's current crop of middle-school children already know they'll have to compete for employment. A historian by training, Holmes begins her book by offering concise background on the last 60 years of China's history, including the momentous move from a planned to a market economy following the 1976 death of Mao. But she consciously avoids political critique. Holmes' main concern is to give readers outside China a glimpse "behind the headlines," as she puts it, using intimate portraits. "I really wanted to give a face to 1.3 billion people," says the author. Students and Teachers ends with a detailed look at how China's government is grappling with the new realities and side effects of a market economy: unequal health-care distribution, a growing gap between urban rich and rural poor, decentralized primary education that many families can no longer afford, and widespread pollution. But, as Holmes will point out in upcoming talks, change is occurring so fast that even those assessments are now outdated. On a recent return visit to China, bearing copies of her book for her interviewees, the author found that only one thing hadn't changed: her friendships. 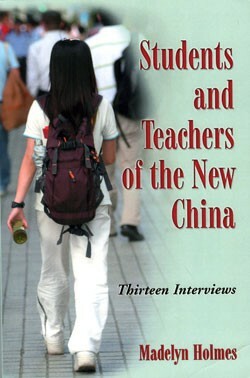 Students and Teachers of the New China: Thirteen Interviews by Madelyn Holmes is available for $35 at Phoenix Books in Essex, at the UVM bookstore and online at Amazon. Holmes will speak at Fletcher Free Library on Saturday, May 3, at 3 p.m., and at Burlington High School on Wednesday, May 7, at 7 p.m.